As we previously reported, The PDGA EuroTour kicked off last weekend in Netherlands, as Dutch Open welcomed a field of 125 players in 7 different divisions. The weekend was victorious for Team Discmania, as Anders Swärd (SWE) won the open division and Seppo Paju (FIN) placed second. Additionally Angelica Frantz (SWE) was placed at tied second place in the womens division and Discmania Junior Team's Sven Rippel's (GER) victory in Juniors topped off a great weekend of Disc Golf. Full list of results here. The tournament itself was not without controversy, as many of the players described the course as toughest they've ever played, and not necessarily in a good way. A vast majority of the critique surrounded the employment of numerous OB areas, many of which were canals filled with water. Some estimates even say, that a solid 6000 EUR (8000 USD) worth of plastic was lost in the canals during the tournament. This naturally left some of the players struggling with gaps in their bags and most probably affected the game of many players. Beside the ultra-challenging course design (MPO winner Anders Swärd was the only player to settle to -3 total score, the rest of the field played over PAR), the tournament was well organized and the Dutch Open Staff have promised to return all the discs they can rescue from the canals to EuroTour's next leg: The Copenhagen Open in just 2 weeks. 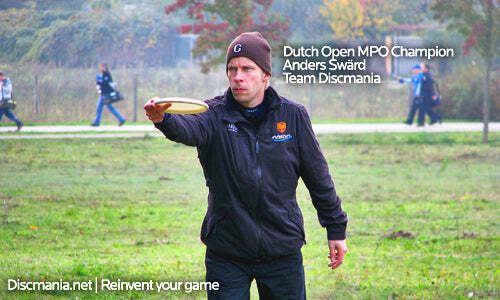 Discmania will once again on top of the action in Copenhagen and we're proud to announce that Discmania Golf Discs will be the main sponsor of Copenhagen Open 2012. PS. Don't miss the S-PD2 release today! Contact your local retailer for availability!